"Everything in moderation" is a pretty good rule to live by, especially where alcohol is concerned. Obvious effects of alcohol on the body are high blood pressure (hypertension), which increases the risk of a heart attack or stroke, liver damage and increased risk of cancers. Another, not so noticeable effect of a drinking problem is that sipping too many Margaritas can also cause you to gain a bunch of excess pounds. There are roughly 200 calories in a pint of beer and about 230 calories in 100 grams of vodka. When a heavy drinker gives up on the alcohol abuse, however, the physical metamorphosis is staggering. 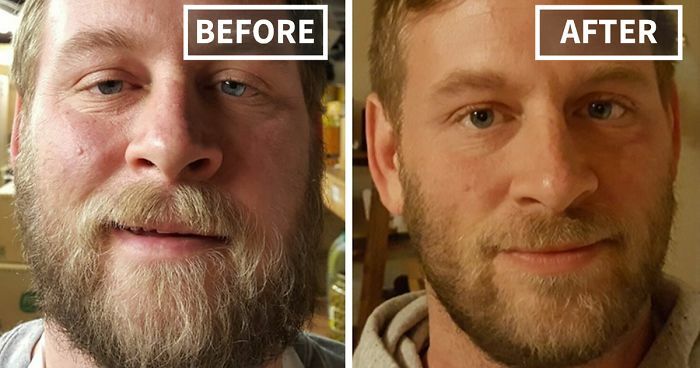 Take a look at these before and after pictures of alcohol recovery to see what we mean. Some of the people in the photographs are barely recognizable when compared alongside their former selves, and while some of them complemented alcohol rehab process with exercise, benefits of quitting drinking cannot be clearer by looking at these pictures. Holy cow! He looks great! All the bloating and redness have gone. What a diffrent well done :0) awesome you. Same guy from number 8. And that's just the outside. Imagine what it did to their brain ad liver. Bravo. Look at that smile. You're glowing! Wow he looks so much younger. This is the 3rd picture with this guy. Thank you! It literally saved his life and allowed both of us to have a life worth living. He went from "NOT" to HOT!! What a handsome fella on the right! Love love love!!!! You are a Rock star! My father FINALLY became sober. I will always wish he had done it when I was a young girl. Good for you! On the left you are in a hospital bed. On the right you are fit and healthy. You should be very proud!! You rock, keep it up. You look so vibrant and years younger! #46 13 Months Sober .. Not Only Did I Stop Alcohol And All Non Aa Substance I Also Stopped Drinking Soda. You're so happy and making so many things happen! So stoked for you girl! Great job!!! You look amazing! Wow!! YOU look healthy and happy! I think the 1st pic is her current pic. It's the same as her profile pic. #55 Best Decision I Ever Made. You look amazing! Keep up the good work! well, you got the mud off anyhow. #58 Before In Late 2011, Trying To Moderate. Got Sober 8/19/2012. After Is In August Of 2016. 45lbs Lighter + My Bp Without Meds Was 196/92, Now It Is 118/62. Wow! Crazy what only 4 months will do. You look great! Keep it up. I dont have a picture but I am hitting my 25th year! Bravo Sister!! Awesome, I have 15 months Sober Life is good..
Wow! You look great! Keep up the good work! #66 3 Months Difference.. Left To Right. Only 3 months and you look so much better. Keep on truckin! I know you! How cool you made it on Bored Panda. You look awesome and so healthy! Well how cute are you!? Congrats on nearing a year! #72 10 Months Down... Fat Face Mcgee. Go Cubs! #82 At 77 Days, I Did My 1st Half Marathon!